First published in 1996, The Embedded Self was lauded as "a brilliant and long overdue rapprochement between psychoanalysis and family therapy conceived by a practitioner trained and experienced in both modalities of treatment." Mary-Joan Gerson’s integrated presentation of psychodynamic and family systems theory invited therapists of either orientation to learn the tools and techniques of the other, to mutual benefit. Firmly grounded in detailed case presentations, her focus on family therapy examined its history, organizing concepts, and developmental approaches, and addressed practical questions of diagnosis, clinical interaction, and referrals. A dozen years later, the psychoanalytic community is more open to integrating perspectives, and the growth of analysts working with couples and families necessitates an update of the material presented in The Embedded Self. Similarly, the family therapy community has deepened its interest in individual dynamics within systemic patterning. From a new and revised perspective on the possibilities of integration, Gerson covers the latest research in neuroscience and the transmission of affect within intimate relationships, with a new chapter on attachment theory and emotionally focused therapy. Sections on narrative therapy and psychoanalytically-oriented family therapy are expanded as well. The Embedded Self was a sterling introduction to family systems theory and therapy, and enhanced the work of analysts and family and couples therapists alike. 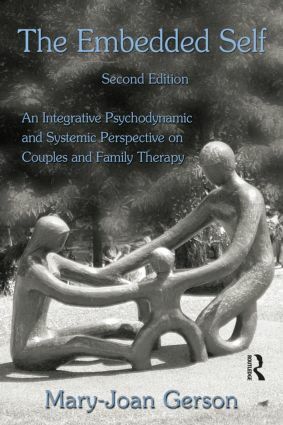 The second edition proves no different in its context but wider in its scope, further enhancing the work of the family therapist interested in individual dynamics, and preparing the psychodynamically-oriented therapist who seeks to extend her craft from the dyad to the triad, and beyond.